This article discusses the usefulness of stretching after exercise and whether it actually improves recovery. Does post-exercise stretching enhance recovery? Post-exercise stretching has been performed as a recovery modality for many decades, if not centuries and beyond, and the current body of research demonstrates that it may have several beneficial effects on recovery. These effects range from decreasing muscle soreness, albeit by a very small amount, increasing flexibility, increasing local blood flow, and decreasing neural excitability. As a result, static stretching may be a useful form of recovery following exercise. This was perhaps first popularised after a particular research publication in the 1960’s . 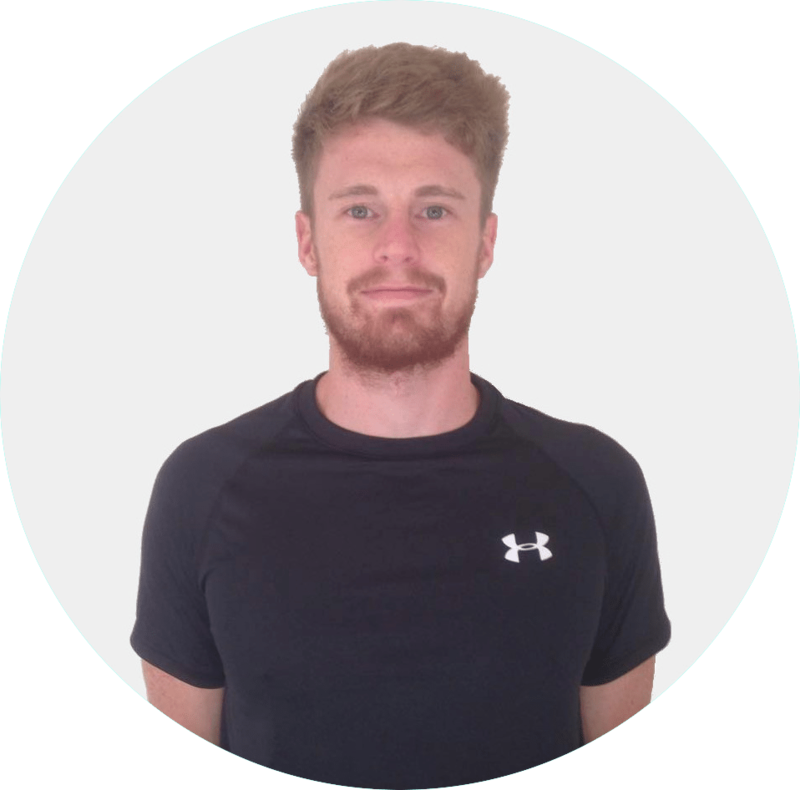 Since then, whilst some of the underpinning theory supporting the usefulness of post-exercise stretching has been discredited, the practice of this recovery modality still persists . “the application of force to musculotendinous structures in order to achieve a change in their length, usually for the purposes of improving joint range of motion, reducing stiffness or soreness, or preparing for an activity.” . 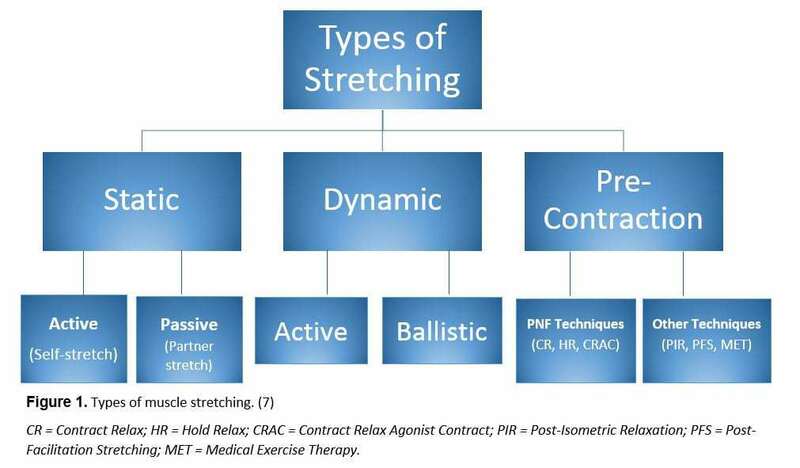 Though there are many forms of stretching (Figure 1), static stretching appears to be the most common type prescribed in post-exercise cool-down routines. Stretching is also classified as either acute or chronic. Acute stretching typically refers to a single stretch usually lasting >30-seconds or less [4, 5]. Chronic stretching refers to repeated stretches over a series of sets, days and even weeks . Recovery is traditionally defined as a 1-stage model, that is, returning something that was lost , or a reestablishment of the initial stage . 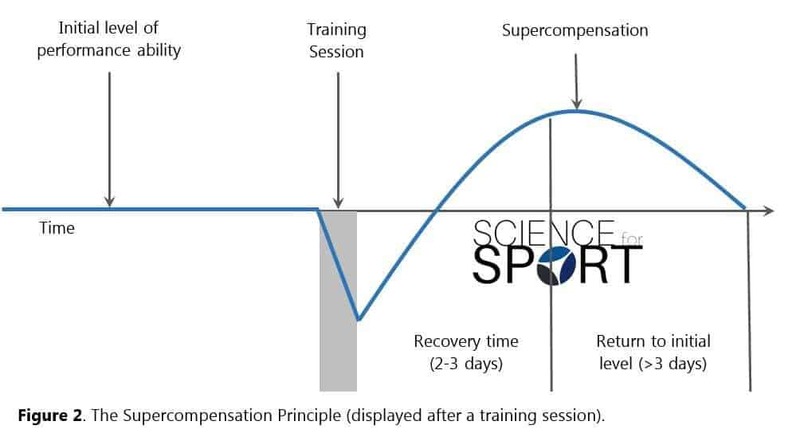 However, recovery in sport, or from exercise is typically seen as a 2-stage model: returning what was lost (e.g. reducing fatigue and re-establishing range of motion), and adapting (i.e. supercompensation) to the imposed training demands . Given this, full recovery should not be considered complete until the athlete has achieved a level of fitness that is higher than pre-exercise levels (i.e. the supercompensation principle). This principle is simply displayed in Figure 2. Before continuing, it is worth noting that other post-exercise modalities such as heat and cold therapies, vibration, massage, hydrotherapy, anaesthetics, and foam rolling have all been shown to reduce muscle soreness and enhance the joint range of motion; thus enhancing recovery [9-17]. During static stretching, blood flow, capillary region oxygenation, and the velocity of red blood cells to the muscle appear to decrease [18-21]. Perhaps this is to be expected as the mechanical strain exerted on the muscle from the stretch is likely to cause vascular compression and lengthening. However, immediately after the stretch is released, blood flow appears to significantly increase beyond its previous pre-stretching levels . Static stretching, therefore, appears to induce a rebounding effect on muscle blood flow – i.e. reduces flow during the stretch, but quickly elevates it afterwards. Temporarily reducing, and then increasing, blood flow may facilitate recovery by improving the delivery of nutrients whilst simultaneously removing metabolites, however, this is yet to be confirmed by research. Reducing muscle soreness after exercise is a cornerstone objective of enhancing recovery. 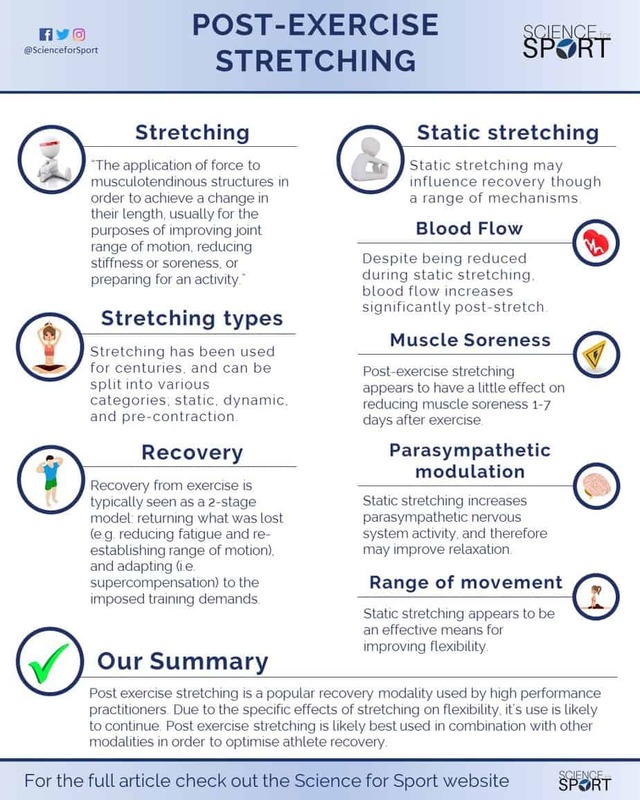 Much research has measured the effects of post-exercise stretching on muscle soreness and very often found positive results ; simply meaning stretching after exercise reduces muscle soreness. Having said this, most of this research has been reported to be of low to moderate quality . One extensive meta-analysis on this topic, including over 2,500 participants, concluded that post-exercise stretching for recovery only reduced the effects of muscle soreness by 1-4 points on a 100-point scale (1-4% improvement) . Despite this figure being statistically significant, the effect is very small. As such, post-exercise static stretching may have little, to no, worthwhile effect on muscle soreness. On the flipside, perhaps every little counts? Things here can get a little complicated, so we will keep it as quick and as straightforward as possible. The easiest way to distinguish the differences between the two is to associate the “fight or flight” responses with the SNS, and “rest and digest” responses with the PSNS. Therefore, the SNS increases heart rate, whilst the PSNS slows it down (Figure 3). Essentially, the PSNS helps facilitate recovery after a stressful event (e.g. competition or training) by counteracting the effects of the SNS which raises excitability and readiness . 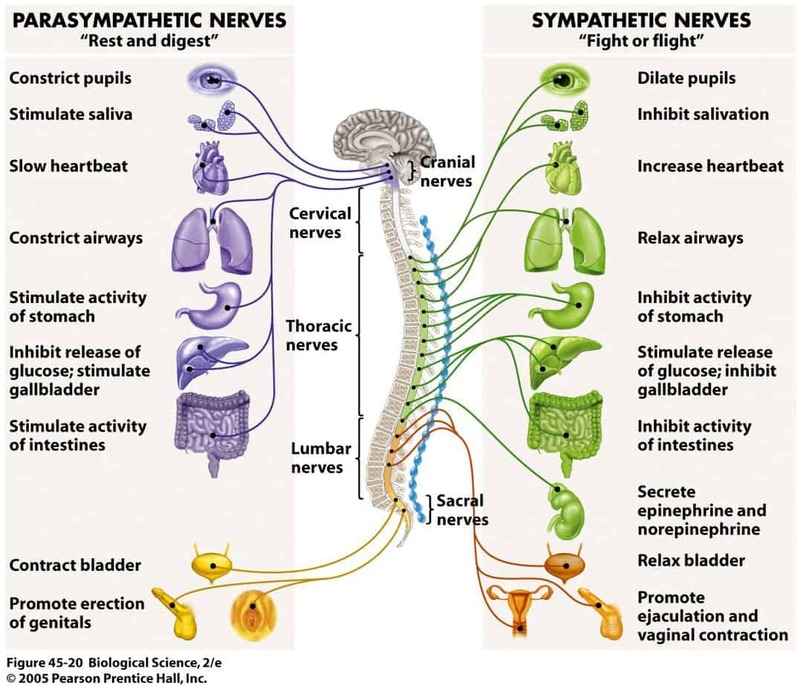 Given this, the PSNS is associated with systemic (whole body) relaxation. Relaxation, which reduces PSNS activity, is an important component of recovery and the rejuvenation of hemostasis and adaptation after exercise. Static stretching has been shown to increase both short-term (same day) and long-term (over multiple weeks) PSNS modulation (i.e. activity), as measured by changes in the activity of the heart (e.g. heart rate variability) [23-28]. For example, performing static stretching daily for 15-minutes, consistently for 28-days, can improve heart rate variability . As a result, static stretching appears to be a useful tool for increasing PSNS activity and therefore promoting relaxation. Flexibility is usually referred to as the range of motion around a joint, or a series of joints (e.g. the spine). Static or pre-contraction stretching techniques are perhaps most frequently used to develop, or increase, joint flexibility – particularly after exercise. It must be understood that there is a difference between ‘stretching’, which is commonly used to improve flexibility, and ‘range of motion’ exercises, which are most commonly referred to as ‘mobility’ exercises . Anecdotal evidence would suggest that stretching after exercise is most often used by coaches and athletes to restore pre-exercise ranges of motion, rather than improving flexibility. Study after study has shown that static stretching can improve joint flexibility [30-37], however, the mechanisms in which it does are still not completely clear. As some research has been unable to show that stretching can improve tissue length (e.g. muscle-tendon unit), it has been suggested that the increases in flexibility are the result of an improved stretch tolerance (ability to withstand the stretch), and not tissue extensibility (e.g. increased muscle-tendon length) [38-42]. Although this has been proposed, newer higher quality evidence demonstrates that static stretching can improve flexibility by altering the mechanical factors associated with tissue stiffness (passive fascicle length and angle) . Static stretching, therefore, appears to improve flexibility and do so by increasing passive fascicle length and decreasing passive fascicle angle. To add to this, static stretching appears to decrease neural excitability by as much as 16-88%, observed by changes in spinal reflex and H-reflex responses . Increases in flexibility can also be attributed to decreases in neural excitability . As a result, static stretching may also improve flexibility by decreasing neural excitability, in addition to altering the mechanical structures of the muscle-tendon unit (fascicle length and angle). One key issue surrounding virtually all stretching-based research, is the current ability to appropriately quantify the intensity of stretching – i.e. how do you measure the intensity of a stretch? For example, much research has used subjective measures of intensity, such as to the point of pain or just before the point of pain, however, the perception of pain is very different for each person. To further complicate things, discomfort and pain may be exercise specific – suggesting that individuals may have higher stretch tolerances during certain exercises than others . 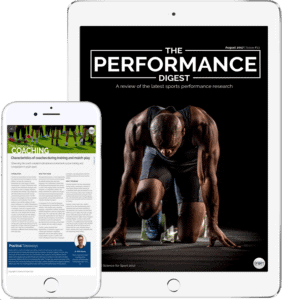 This issue also complicates things further when research is compared – as an athlete may have a higher pain tolerance for a quadriceps stretch, than for a hamstring stretch. Athletes are also often directed to perform a stretch that is pain-free, but the line between mere discomfort and pain is unclear . Furthermore, to the best of our knowledge, no single metric has ever been proposed which can reliably measure (i.e. quantify) the level, intensity, or magnitude of stretching. Direct comparisons between stretching and other recovery modalities and their abilities to improve flexibility (static stretching vs. heat or cold therapy). 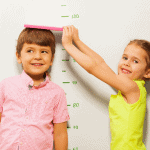 A metric for quantifying (i.e. measuring) the intensity of stretching. Examine the mechanical changes to the muscle-tendon complex imposed by static stretching. Changes in PSNS activity 24, 36, 48, and 96 hours after exercise and stretching. Post-exercise stretching appears to have a little effect on reducing muscle soreness 1-7 days after exercise. Static stretching increases PSNS activity, which may, therefore, improve relaxation. Static stretching appears to be an effective means for improving flexibility by causing changes to both the mechanical properties of the muscle-tendon unit and decreasing neural excitability. Static stretching initially reduces blood flow, capillary region oxygenation, and the velocity of red blood cells to the muscle, but this is significantly increased after the stretch. Recovery entails many, many topics. 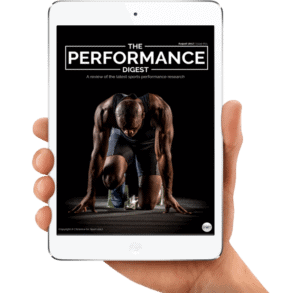 By choosing to simply read up on Post-Exercise Stretching and ignore the sea of other crucial Recovery topics, you run the risk of being detrimental to your athlete’s success and not realising your full potential. To make you an expert coach and make your life as easy as possible, we highly suggest you now check out this article on Foam Rolling. Sands WA. Flexibility. In: USA Diving Coach Development Reference Manual. Malina RM and Gabriel JL, eds. Indianapolis, IN: USA Diving, 2007. pp. 95–103. 74.